Sample provided by Adri from the Netherlands. Many Thanks! Nose: Sweet and Mature with some pleasant Sour Aromas in the background. The Oak is certainly there but not in a terribly dominant way. I would say this Clynelish was bottled at about the right moment. I find Sweet Barley, Butter Kekse (German Butter Biscuits), Straw, Vanilla, Caramel, Nectarine, Orange, Grapefruit, Lemon, Pineapple, light Cinnamon, Mint and traces of Milk Chocolate, Tobacco and Green Apples. The Alcohol is present so be sure to avoid sticking your Nose in the middle of the glass. I usually find the best Aromas, especially the Fruity ones, along the edge of my Copita. Palate: Much More Oak and Wood Spice than the Nose suggests. Here the long years in the Cask become quite clear. I find Sweet Barley, Buttered Pastry, Vanilla, Charred Oak, Nectarine, Orange, Grapefruit, Banana, Mineral tones, Pepper. Menthol, Nutmeg, Gewurztraminer and some traces of Chocolate and Tobacco. I like the combination of the Sweet and Sour flavours. Finish: Middle-Long, Mineral, Fruity, Bitter Sweet and Sour with Malted Barley, Vanilla, Butterscotch, Toffee, Nectarine, Melon, Green Apples, Pear, Grapefruit, Cinnamon, Pepper, Nutmeg, Oak and hints of Tobacco, Chocolate, Banana Ice Cream, Menthol, Minerals and Espresso. I added a little Water and the Nose becomes very Fruity indeed. A bit of extra Cinnamon as well. I almost always prefer to drink my Single Malts neat but in this case you can certainly play with a little water. General Remarks: This Clynelish was distilled on the 14th of July 1997. 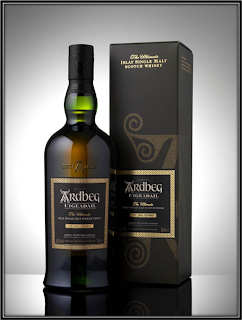 For 18 long years it matured in an Ex-Bourbon Hogshead with Cask # 6942 before being bottled at Cask Strength on the 16th of July 2015. The final price for the participating Casqueteers is roughly 90 US Dollars (May 2016). Conclusion: There are a lot of people who love Clynelish but generally speaking I'm not one of them. Therefore I was pleasantly surprised by this Single Cask. 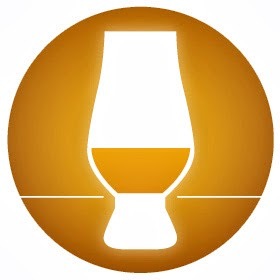 In fact it's my highest score for a Clynelish thus far. It all starts with the Nose that shows a very nice balance between Sweet and Sour Aromas. And there's a lot of Fruit out there as well. On the Palate, the Fruit is still there and I like the balance between Sweet, Sour and Mineral Flavours. But here and in the Finish the Oak and Wood tend to take the upper hand. This Clynelish was bottled in time although I personally think that it could have been bottled a year or so earlier. Still, I believe that the investors in this cask will be quite pleased with the end result and the reasonable price given today's market circumstances. 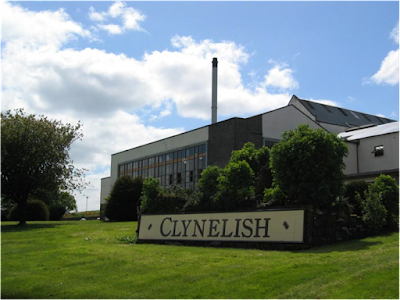 The Clynelish Distillery was opened in 1819 and rebuilt in 1896. In 1968 a new Clynelish Distillery was erected nearby and the old Distillery was renamed Brora (The Bridges River). 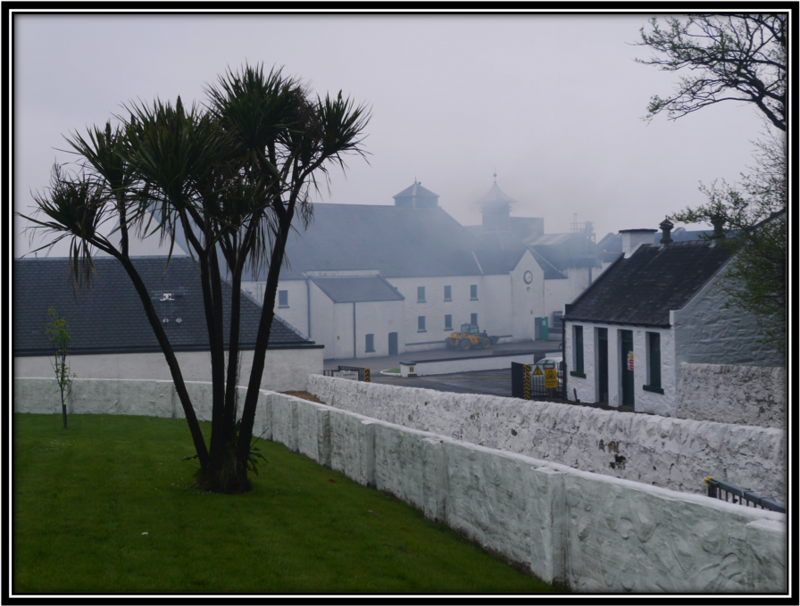 Brora was closed in May 1983 and part of the buildings are used by Clynelish, now owned by Diageo. A lot of the production is destined to be part of the JW Blends. Colour: Amber (Natural Colour). Cask # 6935 definitively gave more colour to the Clynelish spirit. Nose: Quite different from Cask 6942. It's a Rich and Mature Nose but I don't get as many Fresh Fruit notes. I rather find Red Berries, Dried Fruit and Nuts that I would normally link to a Sherry or Red Wine Finish. Interesting! I also find Toasted Barley, Buttered Toast, Caramel, Toffee, Marzipan, Honey or Beeswax, lightly Charred Oak, Straw, Mandarin, Apple, Banana Liqueur and light Varnish. On the Nose, the Alcohol is nicely integrated. Palate: The Wood and Wood Spices are taking the lead here. It's all a bit Edgy and Fiery for my taste. I find Toasted Barley, Charred Oak, Toffee, Mandarin, Lemon, Apples, Ginger Ale, Pepper, Cinnamon, Ginger, Dried Herbs and some Mineral notes. Finish: Quite Long and Dry. A slightly Hot and Rough Alcohol bite towards the end. I find Toasted Barley, Charred Oak, Nuts, Mandarin, Orange, Apples, Pepper, Ginger, Cinnamon, Cardamom and Dried Herbs. This Clynelish does not improve with added Water. Better sip it neat. General Remarks: This Clynelish was distilled on the 14th of July 1997. For 18 long years it matured in an Ex-Bourbon Hogshead with Cask # 6935 before being bottled at Cask Strength on the 16th of July 2015. The final price for the participating Casqueteers is roughly 90 US Dollars. Conclusion: It is generally accepted that more or less 70% of the Flavours and Aromas of a Whisky are generated by the contact between the Spirit and the wood. That makes the Cask all important. 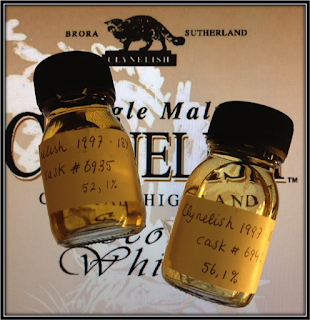 When Nosing and Tasting these two Casqueteers samples it becomes clear what the different Casks have done to the same Clynelish spirit that was distilled on the same day back in 1997. Cask # 6942 was slightly less active and in that way more Fresh Fruit Aromas were preserved. Cask 6935 was a more intense cask and the Wood not only left more colour but also more Wood and Wood Spice and, surprisingly, some Aromas and Flavours that would suggest some Wine influence. In the end I find that both Whiskies have matured well and could have been bottled slightly earlier. For the rest it's, as always, a matter of taste. My personal favourite is cask 6942!